Cowdray House was originally a late 13th century moated manor house, founded by Sir John Bohun. In the early 16th century, Sir David Owen demolishes the house called la Coudraye and began to build the large and imposing Tudor quadrangular house. In 1529, Sir William Fitzwilliam bought the estate and he added the southern and western ranges, when he was granted licence to crenellate in 1533. Square in plan, with buildings arranged around an inner courtyard, the northern and southern ranges have been reduced to their foundations. 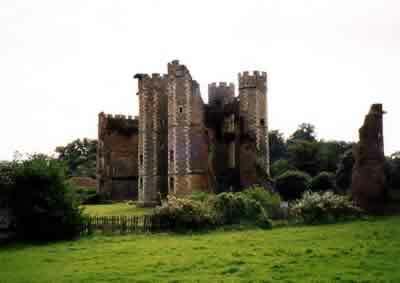 The western range has a central three storey great gatehouse, flanked by octagonal corner turrets, while the impressive eastern range, contained all the principle rooms. In 1793 the house was abandoned, after its destruction by fire, only the detached kitchen block survived. To the south-west on St. Anns Hill is Midhurst Castle and 4 miles east is Lodsworth Castle. Cowdray House is located east of Midhurst, off North Street. 12 miles north of Chichester, on the A286. The site is owned by the Cowdray Heritage Trust and is open, Sunday to Thursday Good Friday and Easter Saturday mid March to October 10:30-5:00pm.